In 2017, Rachel and I started the tradition of a yearly race road trip, which we affectionately titled our “Meatball Road Trip” (thanks to watching Big Brother and one of the house guests referring to everyone as meatballs). Last year’s trip was to Vacation Races Shenandoah Half. This year we checked a bucket list race off at the Bird-in-Hand Half and added a new meatball, Katie, to the mix! If you’re a long time reader of ScootaDoot, you might remember when Vic and Kyle ran in 2013 and again in 2014. Having read Vic’s blog posts, I was expecting it to be hot and humid. That seems to be standard fare for this race. We visited the expo Friday afternoon and the weather was decent. The weekend is a community event in Bird-in-Hand with a hot air balloon festival, picnic, and the race happening. Friday night there’s a 5k and kids race with the half marathon happening on Saturday morning at 7:30 in the am. Communication from the race organizers was primarily via witty email. The race does have social media accounts but there’s not much interaction on those. We got to see a few hot air balloons getting filled as we got our bibs, shirts, and bags with goodies which included whoopie pies, animal crackers, and pretzels. After dinner at Dienner’s (which you know we had a fun time saying repeatedly) we took a trip to Target (what’s a road trip without forgetting random things) and then headed back to our hotel. Perusing the weather app the night before we were pleased to see that it it looked like it was going to be cooler and maybe the tiniest bit misty. Like, barely even noticeable. Therefore we were somewhat surprised when we opened the door of our hotel room on Saturday morning to find a pretty steady stream of rain come down. No more hot air balloons for us. Whomp whomp. Why yes, this picture was taken through a plastic bag. Rachel had a meniscus tear earlier this summer so we knew going into this race that we were going to just have as much fun as possible. Pictures, selfies, mullet crew style – party in the back! With a 4 hour course limit, we knew that we’d be able to finish within the time frame and have fun while doing it so that was our plan from the get-go. Look, the race even gave us a list of things to look for/take pictures (okay, we added that last part in ourselves). We were able to find all of these… except the CAMELS. And trust me when I say we were anticipated seeing the camels over all the other things on the list. The course was absolutely beautiful. Hilly, as we expected, but gorgeous. The water stops were manned by Amish children and they were plentiful. Originally Rachel and I were planning on wearing hydration vests but with the cooler temps we decided to forgo them. It worked out really well. Yeah man, of course you will! Rachel and I weren’t able to keep up with Katie’s running interval so about halfway into the 3rd mile she went ahead and we continued bopping along, doing our thing. We passed by crops and gardens and one room schoolhouses and animals. My favorite part of the course was mile 6, which was an out and back section. We got to see other runners, including lots of friendly faces of Team Shenanigans! A few of the members had run the 5k the night before and were at an intersection giving out Twizzlers and cookies. Yes please! Thank you so much, Barb and Meaghan! Mile 6, we loved ya! There were some more hills and we continued along, occasionally throwing in some running intervals when we felt like it. Oh, did you see up there on the list where it says “road apples”? For those not in the know, road apples are piles of horse poop and they’re common in Amish country. At one point I was chatting with Rachel and very nearly stepped in horse poop. Thankfully she was paying attention where I wasn’t. I ended up doing a quick do-si-do around that! There was one area where the traffic was particularly hairy and it didn’t seem like the vehicles were slowing down considering there was a race going on. It made us understandably nervous, especially when there were cars on both side of the road. I know that not all areas can be a closed course but a suggestion is to have a bit more of a police presence to encourage drivers to slow down. In between miles 9 and 10 we were treated to a scoop of mango Rita’s Water Ice, which was incredible, even on a not hot day. Soon after that we turned off the main road for a little off-roading experience. We chatted with people along the way, our fellow mullet crew friends. Some were not having as much of a party as we were (hey, we’ve all been there), so we tried to quietly encourage. In the last mile there was an area which was matted down grass and mud. It was really uncomfortable because you couldn’t firmly plant your feet. If you did, you might get stuck in the mud; it was better to just tread lightly on the grassy area. It was flat but to be honest, I would take the paved hills over that area any day. But look! A turkey and chicks! Finally we saw the large white tent and turned onto the road that we knew would be the final stretch of our journey. And it’s a good thing too. Our hair. Our faces. We were ready to be done. The medals are made from re-purposed horseshoes and they are incredible! I remember being in awe of them when Vic and Kyle did the race and I’m extremely glad that I finally got one of my own. I felt like this race was untouchable for me for awhile – one that I wouldn’t/couldn’t do because of my lack of speed, not to mention my lack of hill training. I’m glad that I went outside of my comfort zone and had Rachel by my side to have fun with all the way! Sadly, even though we finished within the allotted time, the race photographer was not there to catch our spectacular finish. While I most likely wouldn’t have purchased pictures, I still found it to be a bummer. Thankfully Katie was at the finish and she nabbed a few pictures of us! There was a recovery area and Rachel headed there for a massage while the rest of us went to the tent for the community picnic. The food 100% hit the spot! At $103 for registration (with fees), this race is definitely more pricey than others I’ve done. The race is very well organized and you get a lot of bang for your buck but the price point is worth noting since it’s something I know many take into account when looking at races. Even still, I’m so glad that I’m able to check this one off my bucket list! Next on tap, the Scooby-Doo virtual race (I’ll be sharing more about that in tomorrow’s post! ), which works out really well with my Healthy Kids Running Series starting up this weekend. Hoping that the weather cooperates and we are able to get out there and running with the kids! Oh, one more thing! We’re having a TRISHMOVES giveaway now through Friday (9/14/18) on Instagram! I got to try these delicious bars at the City Fit Girls retreat and they are really yummy. Plus, I’m always one that likes to support Philly based companies, which TRISHMOVES is! Be sure to swing by and enter yourself (and a friend) to win a box! CLICK HERE to enter. I’ve written it on my heart and I am ready for all that 2018 has to offer. Thus far I’ve signed up for 9 races for the upcoming year. That’s right – NINE. I have plans, my friends! While my goal for 2016/2017 were PR based, my goal for 2018 is to focus on shorter distances. 2017 was the first time I did a Good Day for a Run’s Chili Run, a 2 mile race which is just down the street from my house. I decided to return again this year and when my husband had imbibed in a few beers one night, he agreed that I should sign him up as well. Last year’s swag was a really cute chili bowl and spoon. This year all runners will receive a Chili Run Beanie with an embroidered logo! While the January date is already sold out, there is also a February date that appears to have availability left at this point. The race ends at Carolina Blue restaurant and each runner gets a hot cup of chili and a beer ticket! You might recall I did The Light Run a few weeks ago. While at the after-party, my friend Beth won an entry for The Lucky Run. She isn’t quite at the “timed event” mark so she graciously offered the entry to me! I’m very excited for this one because it will be my first 5k of 2018! Unless something else jumps in there ahead of schedule (which is always a possibility). It takes place at the park where I used to teach Stroller Strides so in addition to an awesome event, I’m sure I’ll be a little sentimental too. In 2017 I was so excited for the annual Haddonfield Adrenaline 5k. My husband was looking forward to it, I was looking forward to it… and then the week of the race I realized that I hadn’t registered us for the sold out event. Yeah, somehow in my excitement for the race, I didn’t remember that we hadn’t signed up. We discussed it and I guess I thought I had. But alas, I did not. As soon as I saw that registration was open for 2018, I immediately registered for us. Make no mistake, we WILL be there! This was an impulsive decision. I’ve never run the Philly LOVE RUN before but I feel like I’ve run nearly every other Philly based half and therefore needed to do this one. Of course, a few weeks after I registered for the half distance, a brand spanking new 5k distance was announced. So now I’m vacillating between wanting to stick with the half or seeing if I can switch to the 5k. Hmmm, what to do, what to do. I’m still mulling it over. Disclaimer: I received free entry to the Hot Chocolate Philadelphia race as part of being a BibRave Pro. Learn more about becoming a BibRave Pro (ambassador), and check out BibRave.com to review find and write race reviews! This past year I celebrated my 40th birthday at the Philadelphia Hot Chocolate 15k. In 2018 I’ll be celebrating my 41st (and 6 day) birthday at the Hot Chocolate 5k! And, what’s really, really cool is that many of my friends are going to be at this race too! Retired Scoot a Doot Chick, Bec, will be visiting and will be there; Past guest poster, Ana, just signed up as well. Fellow BibRave Pros Joe, Sara, and Janelle will also be there! I’m returning for my 7th April Fools half marathon in Atlantic City in April as well. I’ve run this race since its inaugural year and I attained my PR this past year on the course! It’s one of my favorite places to do training runs and races. Being that it’s tried and true, I love this race thoroughly. I can’t wait to return for another year of running! This is another race that I’m returning to; this will be my 3rd time running the Run the Vineyards Heritage 5 Miler. Rachel is registered to run it with me and it’s always a great time with her. I’m looking forward to getting out there and stretching my legs on this course. Also, I’m looking forward to chilling and having a glass of wine afterward. It’s all about balance! And now for the portion in my schedule where I jump from APRIL TO AUGUST. I’m certainly that I’ll be filling up the months in between, I just haven’t yet. Here’s a destination race for me – Vacation Races Elk Double. I’ll be taking a little trip across the country to join Jenn at her favorite race weekend! JENN. I get my Jennifer! I haven’t seen her for far too long and I can’t wait! Not only that, but I get to spend 16.2 miles with her. Colorado. If you’ve been there, you know what I mean. If you haven’t been there, you should go! I’m bringing my family along with me! My boys are SO EXCITED for all things travel related but they’re really fixated on going to Colorado. Probably because of number 2. So yes, I am really pumped for this and while I don’t want to rush time along or anything, I am very much looking forward to August! I can’t wait to report back and let you know how all of these go. Plus, I’m looking forward to seeing what other races I add to the list! What events are you looking forward to in 2018? Will I see you at any of these? You guys, has that cloning thing happened yet? Does a Time-Turner exist outside of the pages of Harry Potter? What about a TARDIS? My dear friend, Rachel, ran her second (and she swears LAST) marathon this weekend: the Marine Corps Marathon. As soon as she told me she was tackling the distance again, I was hoping that I’d be able to be there to cheer for her. Once I realized what weekend it was (Victoria and family were coming to visit – YAY), I realized that I’d be cheering from afar. Thankfully, I’ve had practice in cheering for people running races from a distance! I signed up for text message alerts for her race and anxiously awaited that first text telling me that she started the race. So, I just started inundating her with my cheering “signs” and hoping for the best (because I’m persistent!). This was “our song” during the Shenandoah half. Around this time, she texted to let me know that she was running but not getting alerts either. I did a little sleuthing and found the MCM app for my phone. From there I was able to see her location (although not reliably) and I knew she was at the 10k mark. As she got further along in the course, she had to hit certain cut off points and times and she did it. I knew that it was getting more challenging for her and she had to deal with a setback when she had an asthma attack. Still she pushed onward! Rachel really, really likes cats. Made this one while I was in the parking lot at the dollar store. I was just listening to the most recent BibRave podcast and Bart Yasso relayed a story in which Sarah Reinertsen said “Never take a finish line for granted” and I know that Rachel gave this race everything she had yesterday. Rock star status! This weekend was a huge racing weekend so to all of you who got it done yesterday: I’m proud of you, my friends! Whether it a training run or a race, I’m always cheering for you. I’ve had my radar focused on Vacation Races for quite some time. 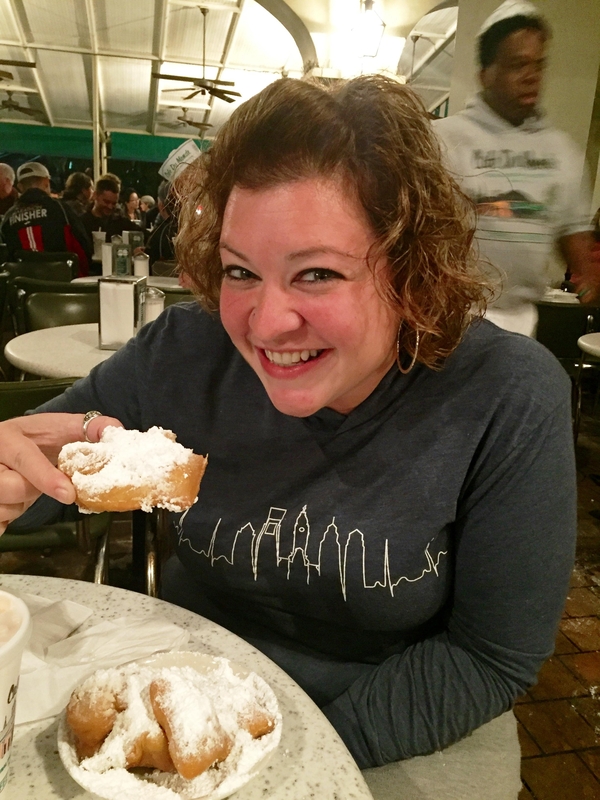 Jenn is our resident Vacation Races ambassador and she swoons about their races. My local pal, Rachel, received a race entry for herself and a friend after a registration mix-up at the 2016 Yellowstone race. She reached out to me in February with a “What do you typically do over Labor Day weekend” message. So then she said, “Let’s take a road trip to Virginia, do this half marathon together, and have a blast!” Well, how could I say no to that? I was in! Except the code they provided didn’t work! Agh, maybe I wasn’t in? There was about a week of back and forth emails with a few people being looped in along the way. I’ll be honest, it was frustrating and we even questioned if it would be worth the time and effort (this was after a registration snafu for Rachel the first time around, so you can see why we were disappointed). I was given a few different codes to try before finally being manually entered into the system. THEN I was officially in. Rachel and I were able to breathe easy once more and looked forward to our September trip. As our trip grew closer, we ironed out travel details and of course, kept our eyes on the weather. Which wasn’t looking great. Rainy. However, the temperature was cooling considerably and I’d much rather run in 55 degrees than 80. We had high hopes that the rain wouldn’t be too bad. Rachel drove to NJ from PA and our road trip, which we affectionately called “Meatball Road Trip 2k17” (if you watch Big Brother this season, you’ll understand where this originated) officially commenced. We talked, sang and car danced all the way down through Delaware, Maryland, and into Virginia. The ride was about 4 hours and we went straight to the expo to grab our shirts and bibs. Of course, it started to rain, which we were less than impressed with… but it was expected. Rachel’s face accurately captures our unimpressedness. Why do I look so happy? The shirt reminds me of St. Patrick’s Day, which is probably when I’ll wear it. Sadly, green is not my color. The expo was small but fun. I think we would have spent more time there had it not been raining but we decided to save up our rain time for the half. After learning how to turn a t-shirt into a bag (totally going to do this activity with our Cub Scout den), making s’mores, and finding our names on the inaugural Shenandoah design, we took some time to ask a few questions to announcer/race coordinator, Kaelee. She’d run the course in the morning so she was able to give us some pointers and let us know what to look forward to the next day. We took the time to be tourists and visited Luray Caverns, which was pretty amazing (and of course we commented how cool it would be if we could run through it). From the get-go we knew we wouldn’t be racing this half. Our mantra was “have fun and get it done.” This was going to be a “mullet crew” experience – as in, a party in the back! No shame! After a delicious dinner we decided to hit the sack, knowing we’d be waking up at 5am. The race began at 7am and was a point to point race and almost entirely on road, save the first and last 10th of a mile. You could park at either the start or finish and they had school buses to shuttle runners from one point to the other. We decided we’d rather shuttle before the race than after; we parked at the finish and shuttled to the start. As we made our way from the parking lot to where the shuttles were, it was before sunrise and I found myself wish that I had brought my Knuckle Lights, just to see where we were going. We shuffled to the shuttles and were able to grab the last two seats on the bus heading toward the starting area. At the start, there was coffee and hot chocolate. They also offered bananas and things like Vaseline and thoughtful touches that runners might find useful. Just as we got our beverages, huge raindrops started plopping on us. At first, neither of us could comprehend what was happening, our brains weren’t full awake yet! We quickly found shelter nearby and chatted with other runners as we did our best to stay dry. We both had plastic rain ponchos yet neither of us had them on when the rain had started. It caught us all by surprise! The rain tapered off just in time for the National Anthem and I really loved that this guy got to stand on top of the box truck and hold the flag. Mother Nature couldn’t decide what she wanted to do – one minute it was drizzling, the next it wasn’t. Rachel and I kept muttering to each other “this is stupid” as we lined up near our pace sign. Seriously, sometimes I question my sanity. My socks were already wet and it was cold! I knew once I started moving I’d be fine, it’s just getting to that point. There was a guy near the start that was telling us, “It’s just a really long 5k” which made us chuckle. Sure enough, once we started moving, we were good to go. Actually, really good. Actually, really, really good. As in, we hit the mile marker and were shocked that we were already at a mile. You guys, this continued for miles 2-8. We would come to a mile marker and be amazed that we got there as quickly as we did. Which, for the record, wasn’t quick; we were having conversational miles. But we were feeling good and powering up the uphills/taking advantage of the downhills. Virginia was lovely, with lots of local flair that we northerns aren’t accustom to seeing on a daily basis. We saw llamas (or were they alpaca? ), plenty of cows, and were graced with the presence of a kitten in the middle of the road near mile 7. This kitten sat smack in the middle of the road and got attention for each and every single runner that came through. He had life all figured out for such a little guy. If the kitten didn’t have a collar on, I’m pretty sure that Rachel would have a third cat right now. The aid stations were perfectly placed. Vacation Races is a cup free race, so they offer hydropouches or you can bring your own hydration system. I opted to get a pack (I’ve been considering it for awhile and this was the perfect reason) and ended up not needing to fill the bladder of it at all – it was the perfect amount for the half distance. They had Honey Stingers available at every aid station, as well as cut up bananas and orange slices at the later stations. At the mile 3 aid station they even had a bin where runners could drop clothes that they’d then drive to the finish line of the race! I didn’t need to take advantage of that but they really seemed to think of everything. The course was quiet, although it was on an open road so cars were allowed to drive along the course. In the early morning, there was not much traffic. We all looked out for each other, calling “CAR!” when there was a car either behind or coming toward us. Some runners had their earbuds in and couldn’t hear the warning until the cars were right behind them and honking. Yikes! Locals sat on their porches, watching the spectacle. It was an endless parade of over 1,100 people streaming by. We waved to people as we passed. I think this was around the time we started singing “HandClap” by Fitz and The Tantrums. The first time. There were multiple times. Mile 10 onward felt like a continuous uphill. I know that there was some downhill too but I don’t really remember much of that. It just felt like we were constantly climbing. Having looked at the elevation map ahead of time, we knew that it was coming but, whew, my hamstrings and glutes acted like they weren’t made aware of the situation! You better believe we flew down that last hill! We turned into Lake Arrowhead Park for the last stretch of the race. The support here was incredible with lots of finishers cheering us. Volunteers pointed us in the right direction since it was along grass and gravel. We turned for the last 10th of a mile and crossed the finish line with huge smiles on our faces! We did it! Check out those AH-MAZING medals! Immediately after crossing the finish line we were able to get our medals and our snack boxes that were filled with lots of delicious treats. From start to finish, this getaway was an awesome! Despite some reservations at the beginning with registration, everything else was absolutely flawless. Vacation Races knows about hosting a quality event and they’ve zeroed in on the things that stand out to runners. I’m grateful to Rachel for inviting me to join her and I’m definitely impressed by Vacation Races! Next race for me is the Rock ‘n Roll Philadelphia half marathon on September 17th. Then in October I’ll be at Run the Vineyards, Enoteca 5k and Run Inspired 10k in DE (code BibRave saves 10%). Fall racing, you have arrived! What do you have on tap this fall? I was a hot mess on Sunday morning. Which is pretty funny, considering that this was my 4th year in a row participating in the Jog ‘n Hog. One might think that I have things down by now. Team Scoot a Doot was comprised of myself, Rachel, and Christina this year. I adore these ladies and I was so happy that we were together for this year’s race. However, we had a few false starts the morning of the race. There were a couple of times we thought we might be watching from the sidelines instead of participating! I’m not exactly sure how we so royally messed up but we managed to do it up big. Let me count the ways. We somehow thought that the race started at 9:30. Au cointreau, mon frere. It started at 8:30. It takes me approximately an hour to get there so as soon as Rachel realized our mistake and messaged us, I jumped in my car to head to Shady Brook Farm! The GPS estimated time of arrival was 8:10. Lesson learned: Pay attention to the race emails – don’t just make up times in your head. Sorry sprinkles, chocolate sauce, and whipped cream, you’re taking a back seat this year. Cookies for toppings it is! Hey, guess what?! The Ben Franklin Bridge was closed for the American Cancer Society’s charity bike event. You and I both know that’s a worthy cause so I didn’t get too upset. Thankfully I was actually paying attention, saw the bridge closure signs, and hopped on the Walt instead… which actually shaved 5 minutes from my arrival time. (Huh.) Lesson learned: Map out your route and look for potential road closures or delays before the morning of the race. All roads lead to Jog ‘n Hog. Just not that one between the hours of 5:45-7:45. Got to Shady Brook Farm with plenty of time to spare. My heart resumed its normal pitter patter. Found Christina, who got there first and got our bibs and shirts (love the laid back attitude of this race that makes it possible for her to do that!) and made us the CUTEST piggy ears ever. Rachel and her brother, Bob, rolled up minutes later. We were actually able to hang out and selfie/chat for a couple of minutes and catch up with the Jog ‘n Hog brothers, Brian and Andrew. It was all going to be okay! Lesson learned: Despite a few small freak outs, everything is better once you’ve found your friends (and are wearing pig ears). We figured smooth sailing from here on out. As we approached the starting line we realized that there was no pace pig! My goals this year were to 1. Eat the entire pint of ice cream and 2. Beat the pace pig. But how can one be beaten if there isn’t one to beat? I quickly realized that I must eat the entire pint, no ifs, ands, or buts! Lesson learned: Be flexible and be prepared to eat all the ice cream. This family’s costumes were on point! Within the first 10th of a mile, Christina realized that her key had fallen off her shoelace where it had been carefully tied! Were the running fates mocking us? Maybe the 2016 Jog ‘n Hog was just not meant to be? We quickly turned around and headed back down the gravel path. Thankfully a very kind soul found the key! I tucked it into my SpiBelt for safe keeping and we were back on track. Lesson learned: SpiBelt over shoelace. From there, it was smooth sailing! It was so great to spend time with Christina and Rachel, catching up with them as we motored to the ice cream station. They are both members of S.W.I.F.T. (Strong Women in Fitness Together) so I got to learn more about that and their plans to dominate Ragnar in a couple of months. Uncle Dave’s Vanilla Beanie Ice Cream! Thanks to the local radio station, the music was pumping in the ice cream eating station area and we was ready to go! Thanks to Uncle Dave’s for this pic! But first, Rachel and I had to figure out how to open the top of the ice cream (there was a pull tab, for the record). After we got past that obstacle, we were ready to dig in! Guys, I downed that pint of ice cream like it was my job! (That would be a rad job, actually. I digress.) I’m not sure how or why but I had the professional, Christina, coaching me and I was up for the challenge this year. The path back seemed a lot longer than the one there (it wasn’t) and my cohorts took the time to run though the sprinklers, which I tried to take a picture of but it just didn’t happen. It was hot, there was sweat dripping in my eyes, and we were some of the last people to cross the finish line. Many thanks to Jog ‘n Hog for the complimentary entries for me and mine. All opinions are my own and I’ll always share my cookies with you. 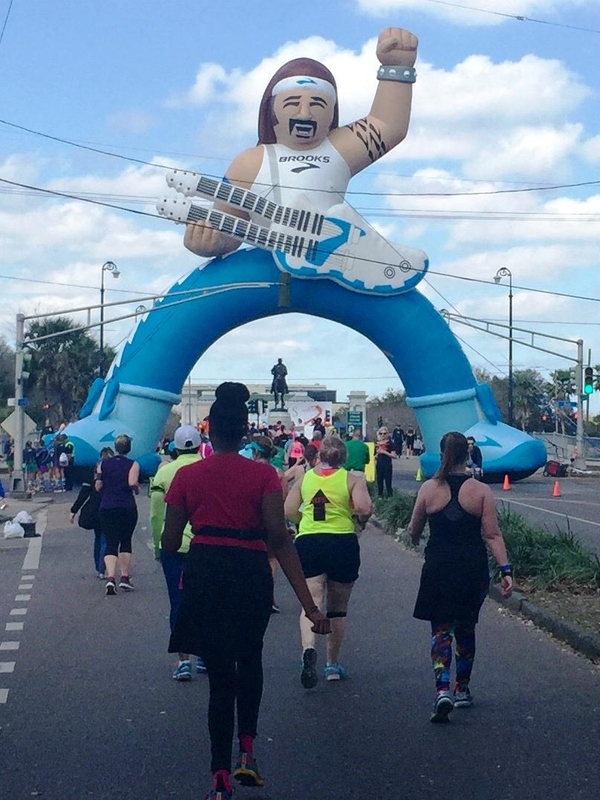 When Meridith contacted me last week and asked me to write a guest post for Scoot a Doot about the New Orleans Rock N Roll Half Marathon, I was super excited! I had this natural high after finishing my first half marathon this year (and fourth half marathon since last June) and getting a PR! I love reading all the posts on this blog written by real women all over and the idea that someone would be interested in what I have to say is beyond me! Then suddenly I found myself getting nervous and wanting to back out. You see, I have this terrible habit that I know no one else has: comparing myself to other people. 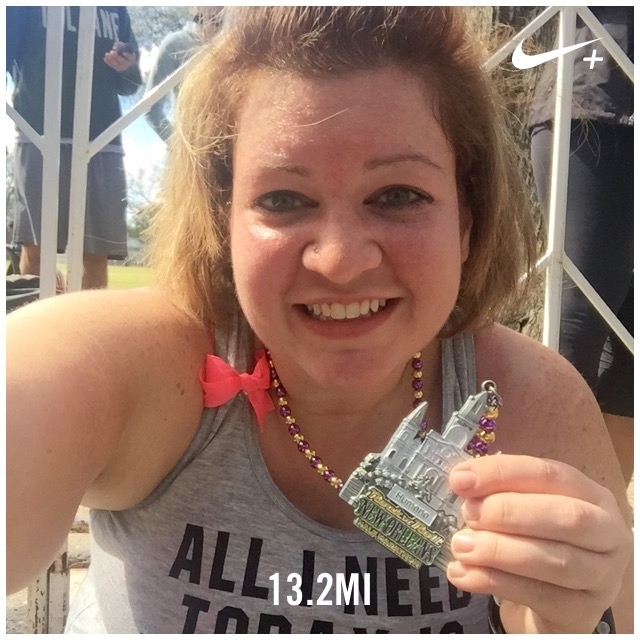 Although I totally PR’ed in this race, I started thinking, “But for most people, it’s not a PR… for most people, my time is practically walking a half marathon!” Then I remembered that I’m not most people… I’m me, you are you and my fitness journey may not be exactly like anyone else’s and that’s okay! But let’s get back to the topic at hand, lest I ramble on. 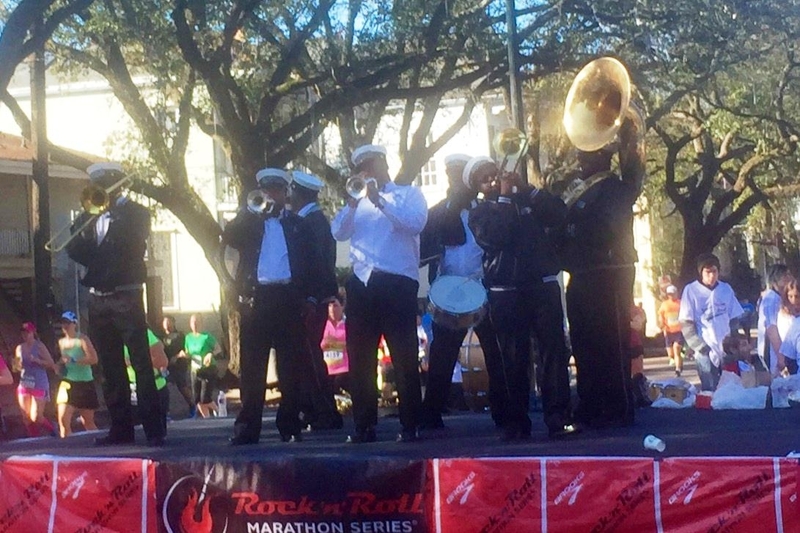 There are several reasons why I signed up for the New Orleans Rock N Roll half marathon. It’s the birthplace of jazz – where else are you gonna hear fantastic live jazz? Have I mentioned the food yet? 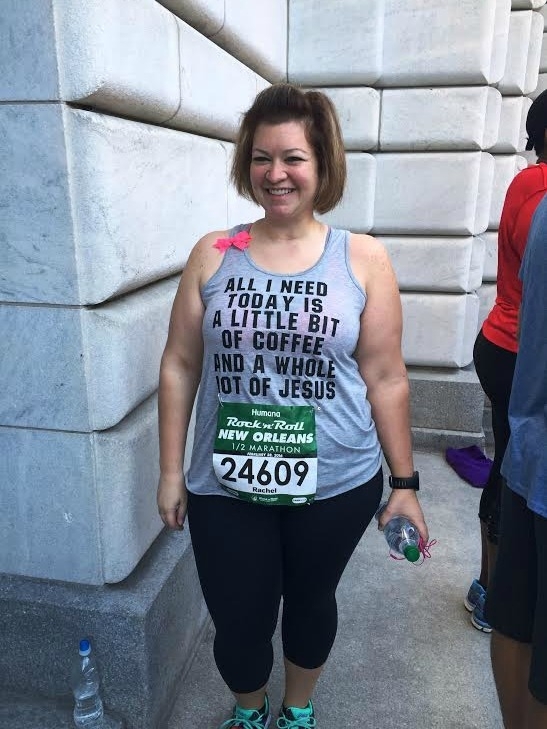 On Saturday, February 27, I picked up my friend Chonda in Mississippi and we drove to New Orleans for the Rock N Roll Half. I flew from chilly Philadelphia, so stepping outside in the warm, southern sunshine was a welcomed change! We headed to the Convention Center to pick up our race packets. Driving around downtown really wasn’t the nightmare I thought it would be (nothing compared to driving around Philly!) and there was plenty of parking around the Convention Center. The expo was not as big as other expos I’d gone to before. I wish there had been more vendors, but packet pick up was well organized and we enjoyed walking around the expo. The rest of the afternoon we strolled around the French Quarter. We got back to our hotel and realized we’d walked nearly 8 miles and our feet were tired. Probably shouldn’t have done quite so much walking before running a half marathon the next day! Whoops! We stayed in the Holiday Inn – Downtown Superdome. It was a bit pricey, but we picked this hotel because it was only a few blocks walk from the starting line. We knew there would be a ton of road closures early in the morning and didn’t want to worry about transportation. On Sunday, February 28, I woke up excited and ready to run. The 10k started at 7am and the half and full marathon started at 7:30am. We left the hotel around 7am in search of our corral, among the estimated 22,000 other runners. My biggest concern going into this was the weather. I’m not a summer runner – any kind of heat turns me into a complete baby. Thankfully the weather was perfect: a little cool before the run, but that chill quickly left a few miles into the race. I didn’t need any extra throwaway layers before the race; I was comfortable in just my tank and capris. Being the back of the packer that I am, I made my way to corral #20 where my friends were waiting. The corrals were divided by the 1000s and there were 22 corrals. They let a corral of people go every 2 minutes, so it took us a good 40 minutes just to get up to the starting line. I was excited to be at the front of my corral. In previous races, it was hard to get maneuver around walkers because I’d gone too far back. The race volunteers were fantastic and got us all pumped up and ready to run. The buzzer went off and I took off, but had to remind myself to take it easy. Since I typically go out too fast and end up walking several miles, my only goal was to keep a consistent pace and most of all, I just wanted to enjoy the race! The first few miles ran through downtown New Orleans and were pretty quiet with not much to see. The next few miles ran through the Garden District. Studying all of the colorful, decorative buildings and houses as I ran, combined with the tree-shaded streets really made the miles continue to go by quickly. There was live music every few miles and I stopped to dance, twirl and strut at every single one! I mean, it’s New Orleans, how can you not be moved by the music?! I loved seeing the Disco Amigos along the way cheering us on! 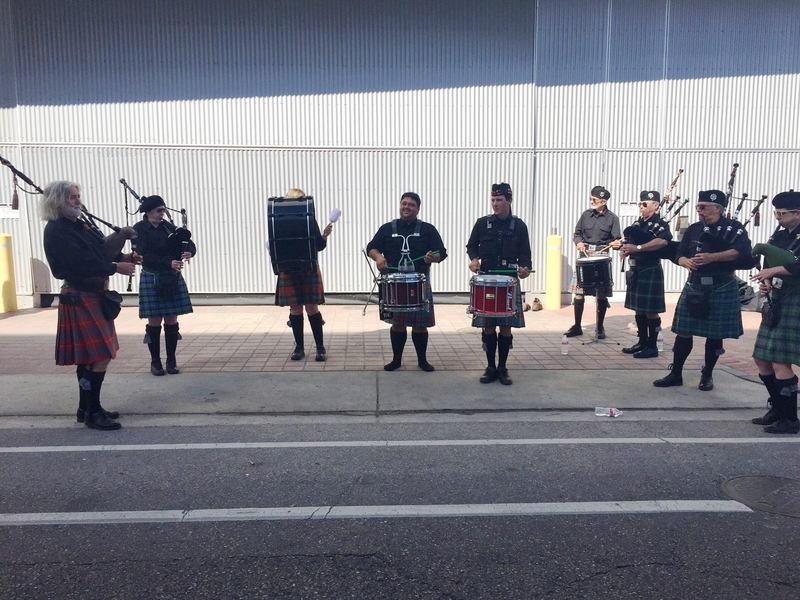 Another favorite was the bagpipers. I slowed down to a walk and listened for a few seconds and then remembered I was running in a race…get moving! 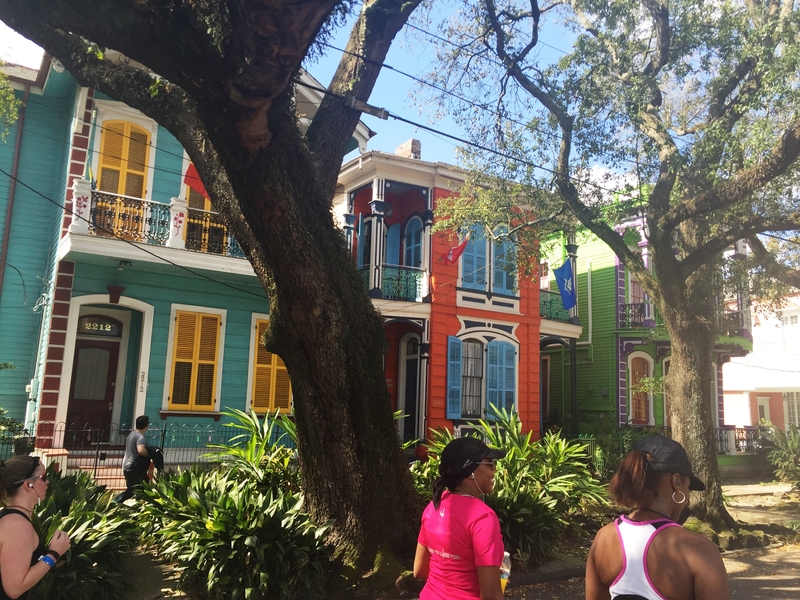 From the Garden District, the race continued into the French Quarter. 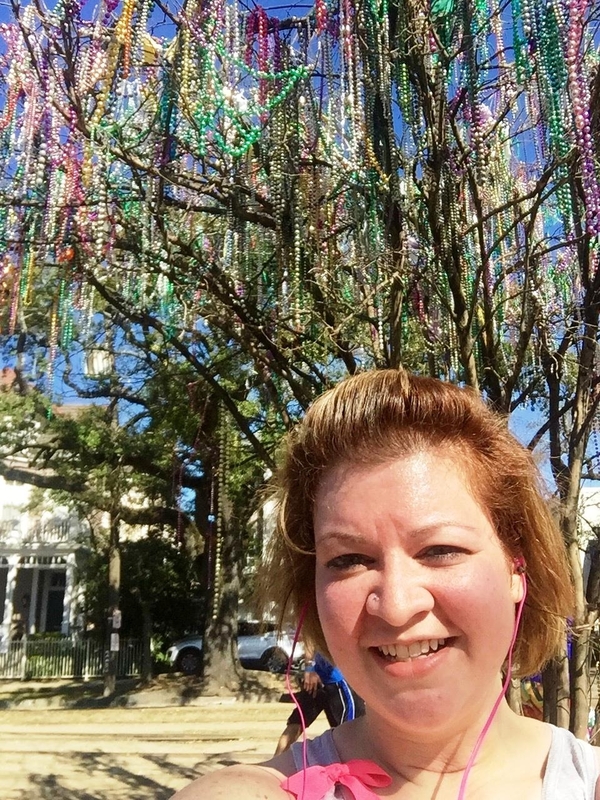 I snapped plenty of pictures of the trees dripping with colorful Mardi Gras beads during miles 6-7 and around mile 8, there were more spectators which means plenty of amusing signs to keep you laughing and running. 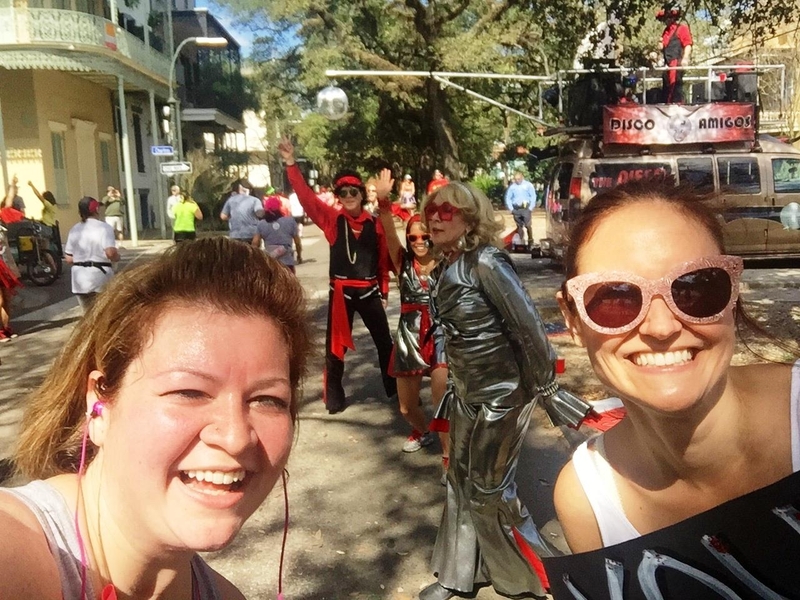 It was in the French Quarter around mile 9 that I looked down at my watch and realized if I kept up my pace, I was going to PR, even after all of my dancing and twirling and selfie snapping! I immediately started the pep talks to keep myself going. I got myself through miles 10 and 11 by composing my “I just landed a new PR” speech…you think I’m kidding, but I had composed an Oscar-worthy speech in my head! The last 2 miles were the toughest for me as we continued into New Orleans City Park. The sun was blazing and there was not the slightest bit of shade to be found! But the all of the supporters and cheerleaders in the last 2 miles of the race were awesome! I crossed the finish line and happily accepted my beaded medal… then looked down to see my PR. I finished in 2:58:01. That’s over a half hour faster than my first half marathon last June. Am I happy I PR’ed? Absolutely. But more importantly, I had FUN! This race was an absolute blast and I’ve already signed up to do it again next year. Wanna join me? Mer here again! Thanks so much to Rachel for sharing her experience with us and CONGRATS on such an awesome PR! Have you run a Rock ‘n Roll race? How do you reward yourself after a great race?